One of the things I love about being part of a CSA farm is that I’m learning a lot about how to prepare food. Like, last year I got schooled in sweet corn. Do you cook it? Then you’re doing it wrong! Fresh from the field corn is so, so good raw. One day when we were there, they taught the kids how to pick and husk the corn in the field, and told them to try it raw. It’s even sweeter raw, and the kids gobbled it up. For the rest of the summer, it was their snack of choice and I didn’t get a chance to cook another ear! 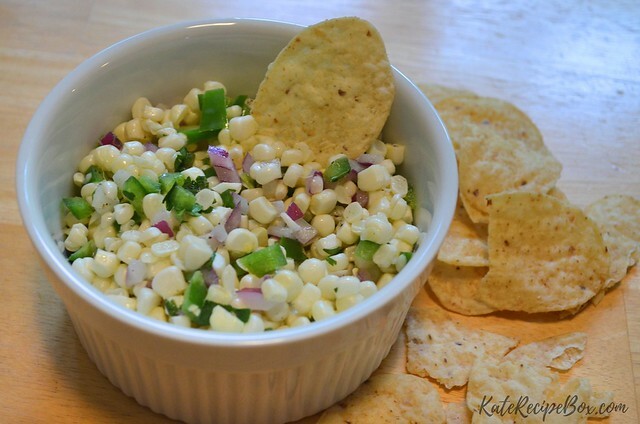 This easy salsa uses farm-fresh sweet corn. If you have a local source, that’s your best option. We love this with chips, but it’s also great tucked in burritos and to top tacos. Stir together the corn, pepper, onion and cilantro. In a small bowl, whisk together the oil, lime juice, salt and pepper. Pour over the corn and toss to coat. 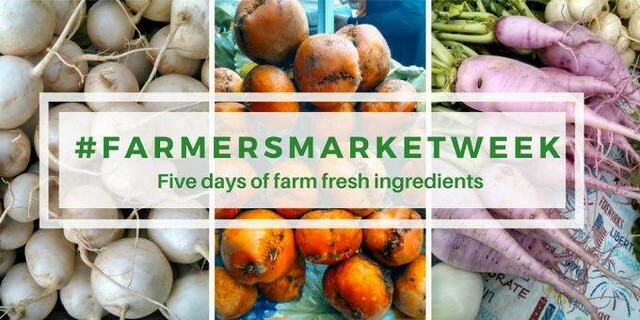 Looking for more #farmersmarketweek inspiration? Here is what my fellow bloggers are cooking up today! We have so much basil in the garden. SO MUCH. I’m sure we always have a lot at this point in the year, but this year it feels like an especially large haul. The obvious way to use up a lot of it? A batch of pesto. I combined two recipes here – the ingredient amounts from one and the method from another. 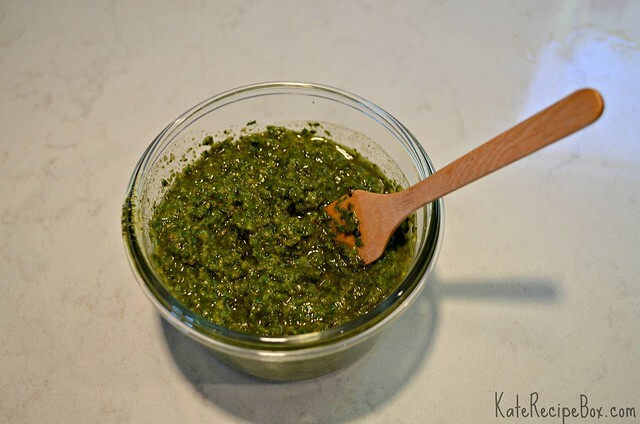 The extra step of toasting the pine nuts and garlic is so worth it here – this is a great, go-to pesto. Now, to use it up! In a small nonstick skillet over medium heat, toast the pine nuts until golden. Transfer to a food processor. Add the unpeeled garlic to the skillet and toast for 1 minute, flip and toast for another minute. Peel and add to the food processor, along with the parmesan and olive oil. Process until smooth. Add the basil and process again, until a paste forms. 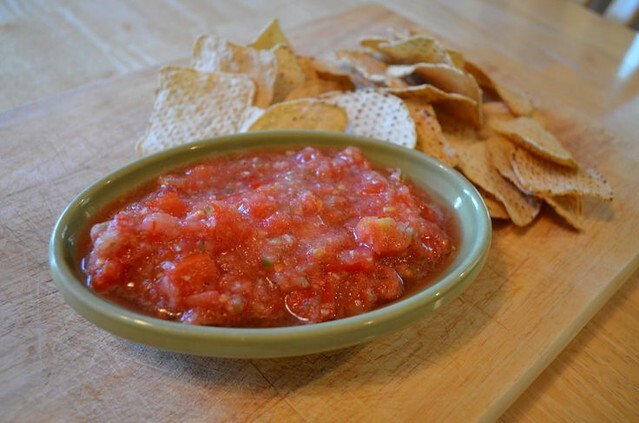 So, rolling with the tomato theme – the other way my husband will eat fresh tomatoes! You knew this was coming, didn’t you? 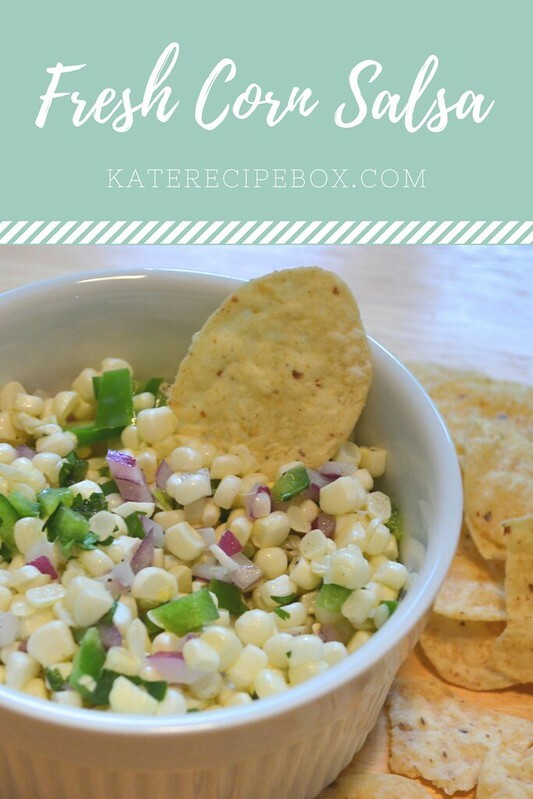 I’m loving this version because we have tomatoes, onions and hot peppers in the garden currently – so I can walk out the back door and grab the ingredients whenever I want and mix this up in about ten minutes. I’m going to miss the garden when the season is over! In a food processor, pulse one of the tomatoes, onion, hot pepper and garlic until finely chopped but still chunky. Transfer to a bowl. Dice remaining tomatoes. Stir into the processed mixture. Stir in lime juice and sugar and season to taste with salt and pepper. Refrigerate until ready to serve. For the latest Blogger’s Choice recipe swap, I was assigned Prevention RD. Her blog is awesome and it’s not just me that thinks so – Nicole recently announced that she’s writing a cookbook based on her blog. How cool is that! The hardest part of this swap was settling on just one recipe. I decided on these because, as much as I love enchiladas, I’d never made them with a green sauce. Nicole used canned enchilada sauce but mentioned in her post that next time she would try making it herself. My garden is currently over-flowing with tomatillos so I decided to make these a totally-from-scratch endeavor. 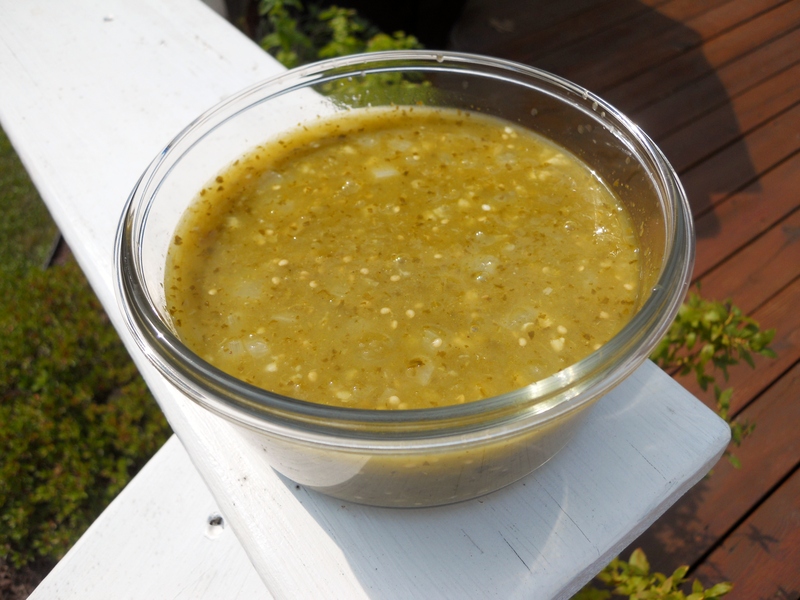 The recipe I used for green enchilada sauce is below. You can see the recipe I used for the tortillas here. 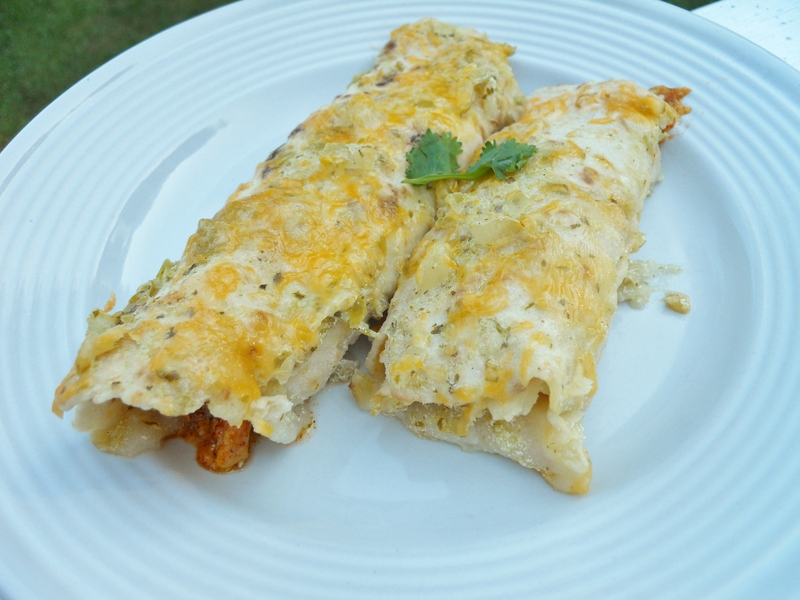 These are probably my favorite enchiladas to date. The honey lime works so well and gives it a really light, summery feel. Hubby and I totally fought over the leftovers! In a medium bowl, whisk together honey, lime juice, chili powder, cumin and garlic powder. Add cooked, shredded chicken and toss to coat. Refrigerate for 30 minutes (or several hours) to marinade. Preheat oven to 350F degrees. Add 1/2 c. green enchilada sauce to the bottom of a 9″x11″ baking dish and spread out to coat the whole bottom. Stir half of the cheese into the marinated chicken. Divide chicken mixture between 12 tortillas. Roll up and place seam-side down in baking dish. Sprinkle remaining cheese over the top. Whisk together half and half and remaining enchilada sauce. Pour evenly over the enchiladas. Cover with foil and bake for 20 minutes. Remove foil and bake for an additional 10 minutes. In a large saucepan, heat oil until shimmering and then add onions and garlic. Cook until onions are translucent. Add tomatillo mixture to cooked onions and stir in cumin, salt and pepper. Simmer for about 30 minutes, until sauce is reduced to about 3 cups. This time of year, I try to make an extra effort to plan our menus around what’s on sale. I mean, who can pass up two pounds of locally grown blueberries for $4? Certainly not me! I turned some these beautiful berries into a barbecue sauce for part of our 4th of July barbecue. Everyone was a little skeptical – blueberries? In barbecue sauce? But they were all completely won over at first bite. 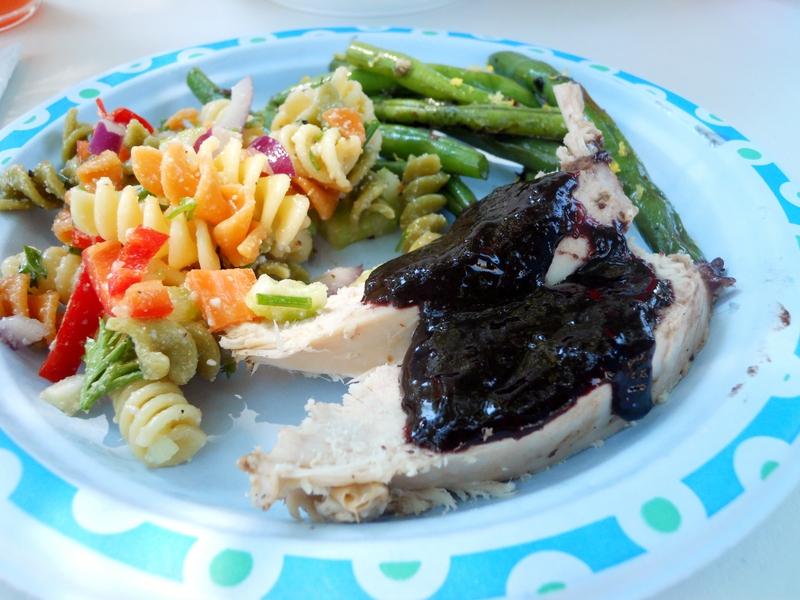 I cooked a turkey breast the night before and then slathered it the blueberry barbecue sauce, wrapped it in foil and tossed it on the grill to warm up the next day. This sauce was great with the turkey, but it would also be fantastic with chicken or pork. Combine all of the ingredients in a medium sauce pan and heat over medium-high heat. Once you hit the boiling point, turn the heat down and simmer for around 15 minutes until the sauce begins to thicken and the berries break down, stirring occasionally. Remove the pan from the heat and allow to cool to room temperature. Pour the sauce into a food processor and blend the ingredients until liquified. Did you know May is National Hamburger Month? I love a good burger. I’ve shared several fun burger recipes before, but a basic burger is just as fantastic when you use the right ingredients. Spike Mendelsohn’s The Good Stuff Cookbook is my favorite source for burger basics (and not so basics). This Good Stuff Sauce is the perfect burger topping, and so quick to make. I really like whipping up his homemade mayo to use as a base, but he recommends Hellman’s in the book if you don’t want to put in the extra effort. Either way, this is an easy sauce to whip up for your National Hamburger Month or Memorial Day feasts! Add the eggs, mustard, vinegar and salt to a food processor. Process for 30 seconds. With the motor running, drizzle in the oil slowly at first, then add a thin, steady stream until the oil is added and mixture is smooth. If too thin, process a little longer. If too thick, it can be thinned with a little hot water. Add the mayonnaise, ketchup, molasses, vinegar and salt to a food processor or blender. My Mom has a strawberry patch in her yard so for a few weeks in the early summer they’re completely inundated with strawberries. This year, they ended up being really busy during strawberry season so when I stopped in one day she passed off several pounds of strawberries to “do something with” – so I decided to make up some jam. 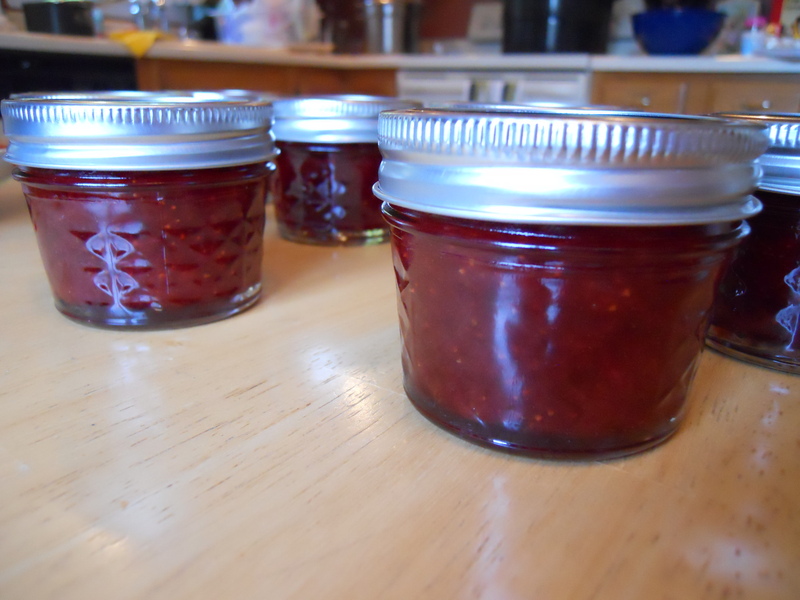 This was my first time making jam – and only my second time canning – but it went incredibly well. I recently picked up Put ’em Up! and it’s an excellent guide for anyone learning to can. This took a bit of time to make, but it was very much worth it – I’ve been loving having the fresh jam on toast for breakfast! Toss the strawberries and sugar in a large bowl and let sit in the refrigerator overnight to coax out the fruit’s juice. Transfer the mixture to a large nonreactive saucepan. Bring to a boil, stirring and crushing to release the juice. Stir in the lemon juice. Continue to cook, stirring frequently, until the jam reaches the desired gel, about 20 minutes. Remove from the heat and let rest for about 5 minutes, stirring occasionally to release air bubbles. Skim off any foam. Use the boiling water method to can: Ladle into clean, hot half-pint canning jars, leaving 1/4 inch of headspace. Release trapped air. Wipe the rims clean; center lids on the jars and screw on the jar bands. Process for 10 minutes. Turn off heat, remove canner lid and let jars rest in the water for 5 minutes. Remove jars and set aside for 24 hours. Check seals, then store in a cool, dark place for up to 1 year. Another great grilled recipe from another cookbook we picked up on vacation. This book came from our trip to Disney a few years ago. I had grand intentions of recreating a nice meal we had there but we ended up doing mostly burgers and chicken fingers so the book got shelved. The worst thing about this book is that it makes me want to go back to Disney – badly. Of course, all of the recipes make you feel like you’re there (just throw on some Disney music and pretend). This marinade gave a nice, sweet steak. You’ll want to turn the steak for the first two minutes to keep it from sticking and to cook it over indirect heat to avoid charring. In a bowl, combine the brown sugar and Jack Daniels and stir until the sugar is dissolved. Mix in the pineapple juice, then the soy sauce, then the water – stirring to combine between each. 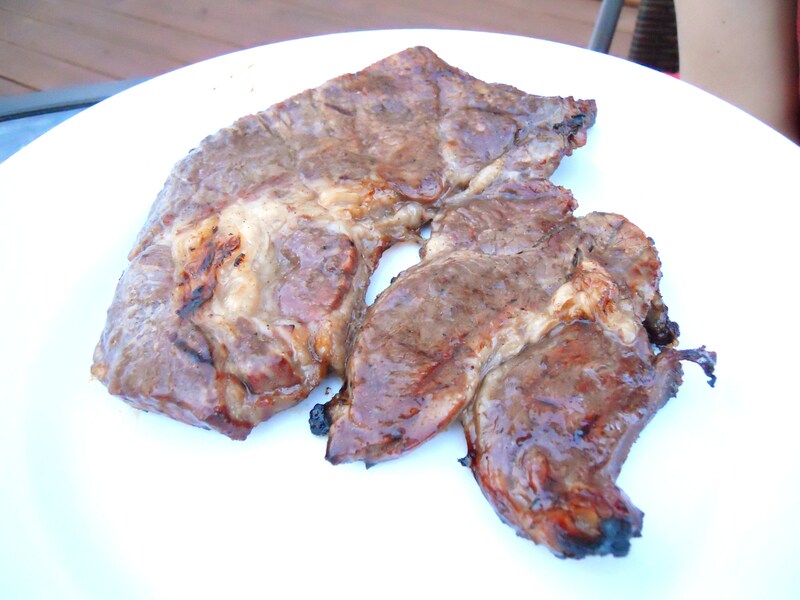 Place steaks in a 9×13″ pan and pour the marinade over. Refrigerate for 24 hours. Mark and I aren’t big fish eaters – he’ll eat some shrimp and I like fried clams. The only mutually agreeable fish dish is frozen fish sticks, so they usually make their once-a-year appearance on a Lenten Friday. 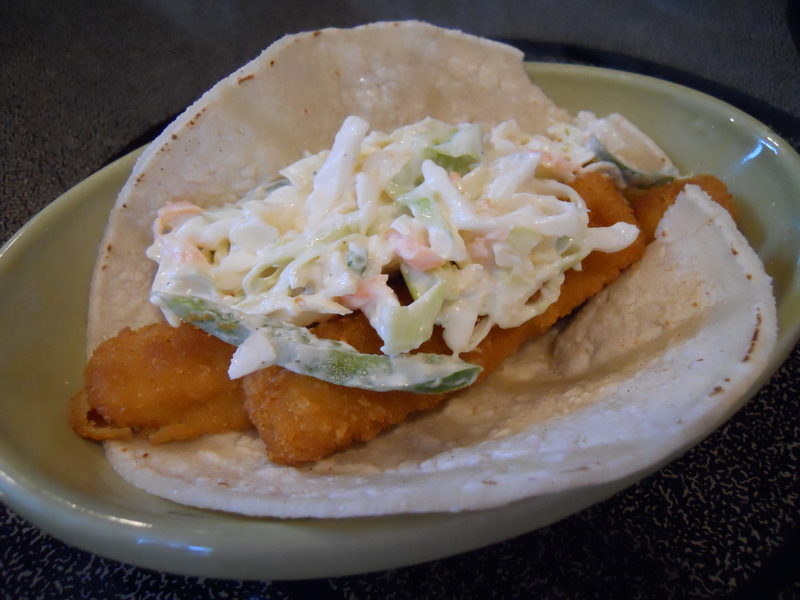 This year, we switched things up and made them into fish stick tacos topped with jalapeno coleslaw. They were good and a welcome change from the usual but the coleslaw was the shining star – it would also be awesome on a pulled barbecue beef sandwich. Toss together grated cabbage, shredded carrot and chopped jalapeno in a large bowl. In a smaller bowl, mix together remaining ingredients and combine well. Pour over cabbage mixture and toss to coat. Refrigerate until ready to serve. The online book club I participate in does quarterly challenges to get everyone reading outside of their comfort zone. One of this quarter’s challenges was to read a book about food and then cook a meal based on it. Pretty fun, right? I chose to read Candyfreak: A Journey Through the Chocolate Underbelly of America by Steve Almond. The book follows the author’s journey to uncover the truth about the candy business – and how much he really loves candy. As a nod to the book, I decided to do an all-chocolate meal. We started with this salad. The salad alone is really awesome but the vinaigrette makes it extra special. You can absolutley tell it’s chocolate, but it’s not over-powering or too sweet. It would be perfect for a Valentine’s Day meal. Toss together spinach and arugala. 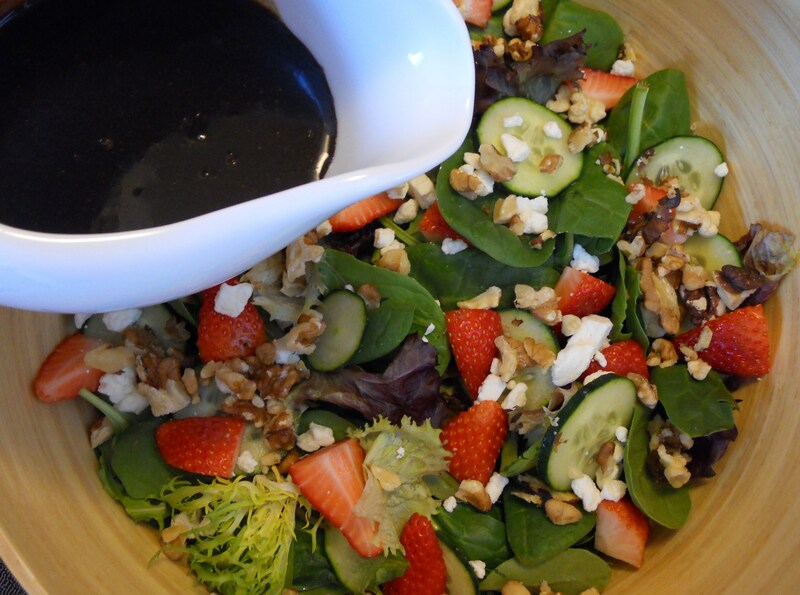 Top with sliced cucumbers, strawberries, feta and walnuts. In a small saucepan, combine vinegar and sugar over low heat until sugar is disolved. Remove from heat and stir in chocolate until melted. Leave to cool at room temperature. Do not refrigerate – the chocolate with solidify. Stir gently before serving. Note: Castor sugar is finer than regular sugar but not as fine as powdered sugar. You can make your own castor sugar by running some regular sugar through a food processor for a few seconds.